Rivers are considered as the sacred places in India. These rivers are not furnished only as water suppliers but also the famous picnic spots in the cities. These places are also the major tourist attraction point. There is always a strong bond between religious places and rivers in India. It is believed that taking a holy dip in these rivers remove all the sins . There are some famous cities situated on the banks of river in India. Agra on Yamuna river : Taj Mahal, the epitome of love reflects the amazing view in Yamuna river. Yamuna river is one of the longest rivers flowing across several cities in India. Yamuna river in Agra gives a silver covering to the city. Yamuna river provides water to the millions of people in India. Kolkata on Hugli River : Howrah Bridge, the classical landmark of Kolkata is suspended over the Hugli river in Kolkata. The river provides historical, artistic and cultural view of the city. The river is also considered as the arm of the Ganga river. Hyderabad on Musi River : The city is famous for its historical sites and is situated on either side of Musi River which separates old city from new city. The Musi river plays an important role in the formation of the city. 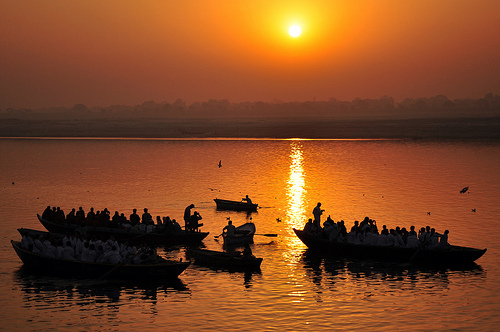 Varanasi on Ganga River : It is believed that a holy dip in the river of Ganga wash out all the sins. Ganda river is also considered as holiest river in India. The city Varanasi or Kashi is blessed with Ganga River. River Ghats in Varanasi is not only a pilgrimage sites but also a very famous tourist attraction point. The evening aarti is the another attraction of Varanasi.